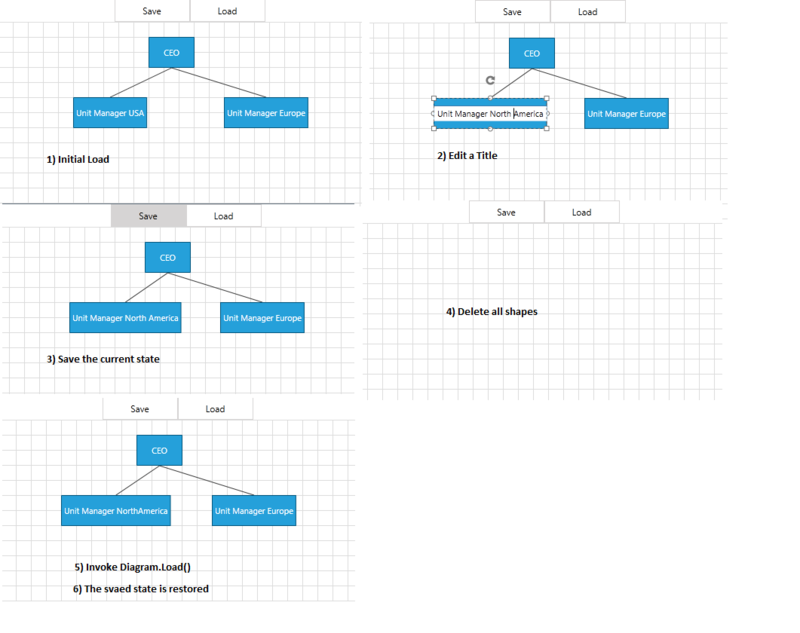 This article shows how to serialize and deserialize the RadDiagram in MVVM scenarios. It also demonstrates how to save/load custom properties from the ViewModels during the serialization / deserialization process. Please keep in mind that the Serialization / Deserialization is internally used in the copy / paste operations of the RadDiagramShapes and RadDiagramConnections. When you need to serialize / deserialize a data-bound RadDiagram, you have to use a GraphSource which implements the ISerializableGraphSource interface from the Telerik.Windows.Diagrams.Core namespace. IObservableGraphSource enables the two-way binding capabilities of the RadDiagram. ISerializableGraphSource (from Telerik.Windows.Controls.Diagrams.Extensions.ViewModels namespace) extends it with Serialization and Deserialization methods for "Links" and "Nodes". Similarly, the SerializableGraphSourceBase class extends the ObservableGraphSourceBase. Please note that when you use the SerializableGraphSourceBase, you have to override the GetNodeUniqueId() method which must return a unique string identifier of your TNode ViewModel. Furthermore your TNode implementation must provide a parameterless constructor. The following section will show you how to save and load properties from your ViewModels during the serialization / deserialization process. If you do not override the GetNodeUniqueId() method, you will receive a compilation error. Also please note that you need to make sure that the method returns a unique value for every Node object. The Save command implementation saves the serialized RadDiagram in a string object. This means that you can use this approach in case you need to save your diagramming structures in a database. Once you have the string saved, you can later retrieve it and load the data using the RadDiagram Load(serializationString) method. You can download a runnable project demonstrating a similar approach from our online SDK repository here, after navigating to Diagram/MVVM. Please note that copy/pasting requires additional effort. Pasting a copied node, for example, means that you have to override the AddNode method of the ObservableGraphSourceBase and provide a new unique Id for the new NodeViewModel.